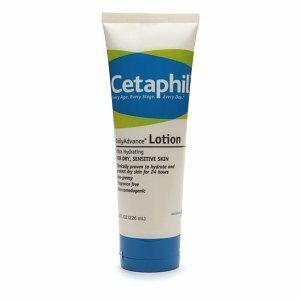 This luxurious lotion is specially formulated to provide everyday intense moisture for dry, sensitive skin.Contains Epidermal Replenishing Complex5 (ERC5), a unique combination of 5 key ingredients that protects dry skin and enhances hydration.Leaves your body feeling soft, hydrated and smooth. 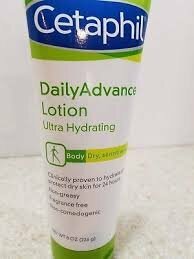 Cetaphil Daily Advance Ultra Hydrating Lotion Clinically proven to hydrate and protect extra dry skin for 24 hours! 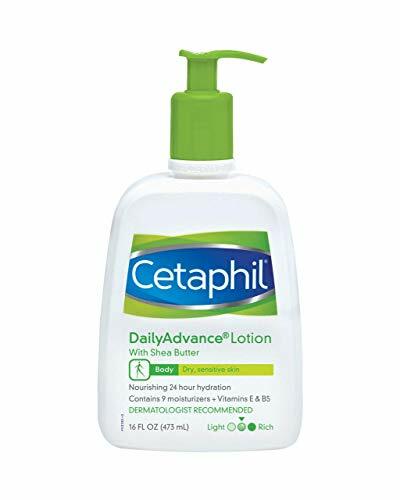 Designed with a unique combination of five key ingredients, Cetaphil DailyAdvance Ultra Hydrating Lotion is clinically proven to hydrate for 24 hours and help replenish lipids. The moisturizing formula is fast-acting, long-lasting, and helps protect extra dry skin. 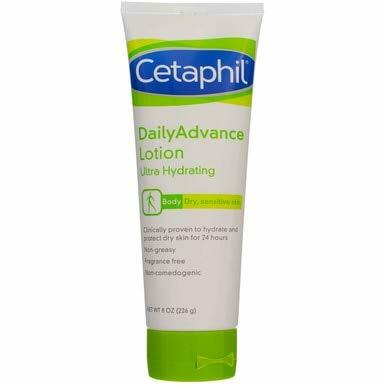 Non-greasy, non-irritating, non-comedogenic and fragrance-free, Cetaphil DailyAdvance Ultra Hydrating Lotion is an ideal full body moisturizer. Ingredients:s: Water, Glycerin, Hydrogenated Polyisobutene, Cetearyl Alcohol, Macadamia Integrifolia Seed Oil (Macadamia Nut Oil), Butyrospermum Parkii (Shea Butter), Acrylates/C10-30 Alkyl acrylate Crosspolymer, Sodium Polyacrylate, Phenoxyethanol, Tocopheryl Acetate, Ceteareth-20, Stearoxytrimethylsilane, Stearyl Alcohol, Benzyl Alcohol, Farnesol, Sodium PCA, Panthenol, Cyclopentasiloxane, Dimethiconol, Citric Acid, Sodium Hydroxide. This luxurious lotion is specially formulated to provide everyday intense moisture for dry, sensitive skin. It contains Epidermal Replenishing Complex5 (ERC5), a unique combination of 5 key ingredients that protects dry skin and enhances hydration. Clinically proven to hydrate and protect dry skin for 24 hours, it leaves your body feeling soft and smooth. Non-greasy and fragrance free. Non-comedogenic. Dermatologist recommended. 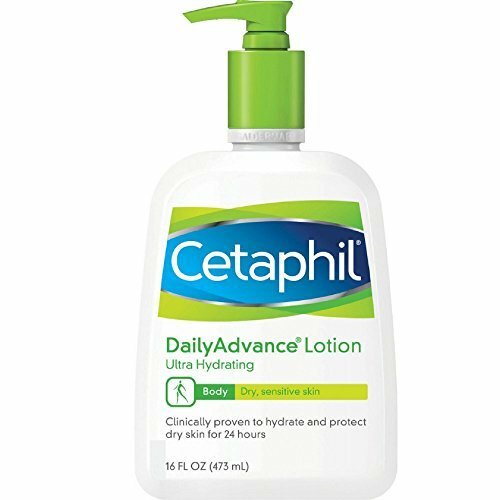 Use the number-one dermatologist recommended brand when you use Cetaphil Daily Advance Ultra Hydrating Lotion For Dry, Sensitive Skin. This is a luxurious lotion that is specially formulated to provide everyday intense hydration for extra dry and delicate skin. 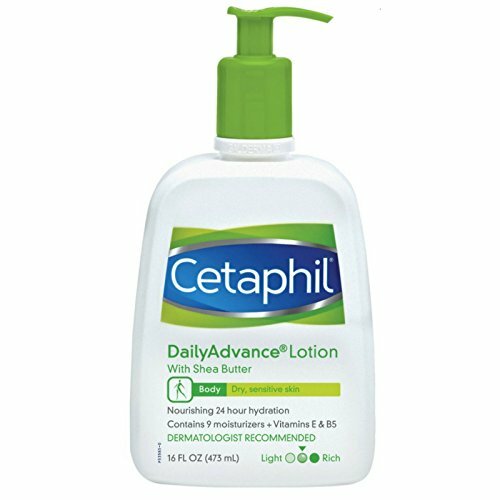 The fragrance-free lotion has a creamy breakthrough formula that uniquely balances ingredients. This provides your skin with an immediate surge of moisture. It leaves your body feeling soft, silky and smooth. Lubriderm Daily Moisture Body Lotion for Sensitive Skin, 16 fl. Eucerin Daily Hydration Broad Spectrum SPF 15 Body Lotion 16.9 fl. Keep your skin hydrated and feeling soft with the Eucerin Daily Protection Moisturizing Body Lotion. It has SPF 15 sunscreen, which helps to protect your skin from sun exposure. It is light and absorbs quickly, so it won't feel greasy on your skin. Eucerin moisturizing lotion protects you all day and is dermatologist recommended. It is also fragrance free.